After repeated failed attempts, an industry giant debuted a completely revamped operating system. The tech press was impressed across the board. With true multitasking, higher screen resolutions, expanded storage, and an innovative graphical user interface, this new OS, wrote Brad Molen, was "precisely what we wanted to see in the first place." It is going to take a fair amount of time for developers to push out enough earth-shaking apps to persuade the typical user that has already heavily invested in their ecosystem of choice. An OS is only as strong as its ecosystem, it's been an ongoing struggle to sell the platform to developers and attract popular titles. A succinct summary of the challenges IBM faced trying to sell OS/2 in a world dominated by DOS and Microsoft Windows. Except the above excerpts are from a 2012 article in Engadget. 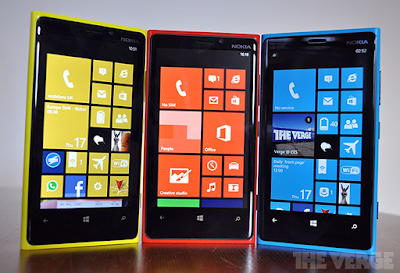 Brad Molen is writing about the debut of Windows Phone 8. The struggle wasn't IBM's but Microsoft's. 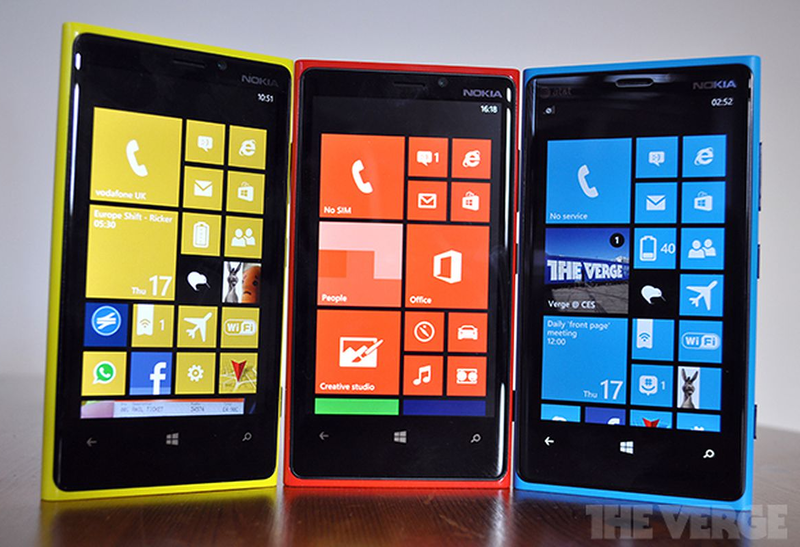 Microsoft came late the market with a technologically competitive product but failed. In the words of the philosopher Friedrich Hegel, "The only thing we learn from history is that we learn nothing from history." As Jim Seymour explained in his 8 December 1992 PC Magazine column, "No one buys a PC to run an operating system. Good applications sell PC hardware; good applications sell operating systems. Every single dazzling PC program I can think of right now is a Windows app." to move from a red-hot CP/M machine to an early IBM PC was a step backward. None of the purveyors of 8-bit microcomputers saw the utility in the IBM PC. Theirs was a robust and mature industry and the 16-bit upstarts had nothing to offer. The IBM, though, had more potential. None of the potential was apparent to the CPM-ers. That was true of my father's Epson QX-10 CP/M machine. Dvorak correctly pinpoints the potential of the 16-bit PC and the standard-setting status of IBM as conntibuting to its success. But he drew the wrong lesson for the future, that "all we need is a platform that the core influencers all agree on and we're off to the races." William Zachmann conceded in the 10 September 1991 issue of PC Magazine that "nobody is going to buy new hardware system or new operating systems is there is no software for them." But then he jumped to the same wrong conclusion. It's the fundamental capabilities of a new platform—not applications—that determine its success or failure. If the platform has "the right stuff" it will succeed even if applications vendors are intially slow to develop for it. The widely cited proof of this thesis is the Macintosh. Dvorak argued in his 29 May 1990 column that just as the IBM PC "had virtually no software when it arrived on the scene, the Macintosh also arrived with nothing but a word processor, an operating system, and a paint program." He thus concluded that "initial massive software support" was not important. In fact, the Macintosh proved the opposite. It debuted with no development tools native to the platform. After a year on the market, it had a quarter of the applications that the primitive IBM PC had a year after its release. Apple only survived because the other Steve—Wozniak—returned to reboot the Apple II line that was keeping the company in the black. Rather, the lesson is that if you are going to establish a new standard in a world not looking for one, you need a lot of patience and a positive cash flow. For his NeXT project, Steve Jobs had more of the former and less of the latter. The NeXT line of computers failed to garner any market share. 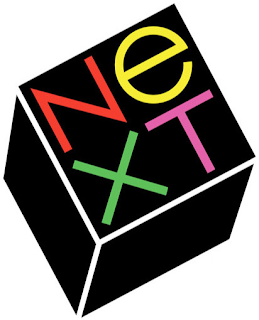 The future of the NeXT OS was to be acquired by Apple. Without an extensive library of software, NeXT never extended its market beyond a handful of vertical applications. Steve Jobs learned his lesson. Soon after returning to Apple, he buried the hatchet with Bill Gates. Along with a $150 million investment, Gates promised ongoing development of the hugely popular Microsoft Office suite for the Mac. In order to be successful, a new operating system has to be both necessary and sufficient: necessary in the sense that it must give computer users a compelling reason to switch; and sufficient in that it must have enough functionality to do all of the things that a computer user would want to do. In other words, the 8-bit computers of the late 1970s were better than nothing, only viewed favorably in terms of the the very low expectations of personal computer users at the time. But by the late 1980s, 16-bit DOS applications like Lotus 1-2-3 and WordPerfect had feature sets more complete than the typical consumer even today will ever use. Keeping the market alive meant selling consumers software solutions they could only imagine they needed, and often, as in the case of the graphical user interface, were sure they didn't. A GUI that can potentially support every graphics video display and every graphics printer ever made for the PC is going to more complex than one needs to support only one video display and two printers, as was the case with the original Mac. I guarantee you, if Apple had put complete Apple II compatibility into the Mac, it would have lost a lot of its simplicity. Microsoft's clunkier but open architecture solution pushed Windows forward on all fronts while generating the necessary cash flow from its legacy operating systems and applications. IBM tried to duplicate this model by building DOS and Windows support into OS/2. But if DOS and Windows were already good enough, why spend more to switch? In his 31 October 1989 column about the downsides of RISC architecture (which also was supposedly going to conquer the PC world), OS/2 stalwart William Zachmann inadvertently explained why OS/2 wouldn't succeed either. For users, the costs of moving from the Intel x86 family to an incompatible RISC-based microprocessor architecture, which would require new versions of every bit of software, are very steep. Users aren't going to make the move without a compelling reason, which RISC alone doesn't provide. Bingo. OS/2 didn't provide a compelling reason to make the move. The default position for anyone not seeking an IBM-branded solution was to keep using DOS and Windows while waiting for the Microsoft to slowly evolve its product line. Which is exactly what the rest of the computing world did. Jim Seymour observed in his 11 June 1991 column (and the same could be said about WordPerfect's OS/2 efforts), "Lotus spent a fortune developing 1-2-3/G for OS/2. It was released—and almost disappeared. No one was using OS/2 so no one cared about apps for it. You've gotta have DOS and Windows versions of your programs." Perhaps nothing drove the point home more decisively than an article by Christopher Barr in the 12 May 1992 PC Magazine. Titled "Waiting for Godot," he summarized a report from the Software Publishing Association, according to which "OS/2 applications accounted for .03 percent of the market" in 1991. Not 3 percent. That's 3/100 of 1 percent. The release of OS/2 2.1 (with Windows 3.1 compatibility) in the summer of 1993 finally propelled it onto the bestseller chart, debuting at number five in the 14 September 1993 issue. IBM had additionally come to its marketing senses and sold OS/2 at retail and via mail order in the same price range as Windows. With IBM claiming to be moving 300,000 copies per month, Bill Machrone noted that "if OS/2 were anything other than an operating system, it would be a runaway bestseller." By contrast, in 1993 alone, MS-DOS 6 shipped a combined 5 million upgrades and 10 million OEM installs. Two weeks later, OS/2 2.1 rose to number four, except those were upgrades from older versions. At number one was Windows 3.1, and those were new installations (everybody with Windows 3.0 had already upgraded). 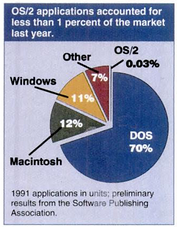 The 12 October 1993 chart showed Windows 3.1 slipping a notch to second place. OS/2 2.1 fell completely off the chart. In one of those signs of the times, in the July 1993 issue, Charles Petzold switched the focus of his Environments column from OS/2 to Windows NT, calling Microsoft's new preemtively multitasking 32-bit operating system "what OS/2 should been in the first place." Over the next five years, new releases of OS/2—such as OS/2 for Windows (ironically) and OS/2 Warp—propelled it onto the bestseller chart for several weeks at a time until it vanished once again, while DOS and Windows upgrades and Microsoft office applications dominated it issue after issue. 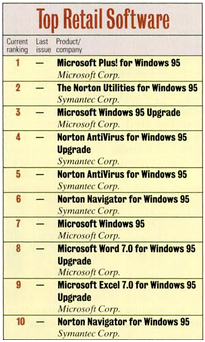 To see where things were headed, consider the bestseller chart following the release of Windows 95 in August of 1995. Microsoft released Windows NT shortly after OS/2 2.1, though not as a consumer product. NT was a high-end workstation and server OS with far more functionality than OS/2. Both NT and Windows 3.1 could natively run apps that were Win32 compliant. OS/2 2.x ran Windows code licensed from Microsoft, a license that expired at the end of 1993. As a result, OS/2 for Windows ran a separate copy of Windows in a virtual DOS machine, a cumbersome solution. In the run-up to Windows 95, IBM at first promoted OS/2 Warp, but ended up licensing Windows 95 on the same terms as Compaq. "IBM officials conceded that OS/2 would not have been a viable operating system to keep them in the PC business." the desktop operating system standard for the next 12 to 18 months will be DOS and Windows 3.1. That's because I've become convinced that we've all understated the importance of compatibility. It's been clear for a long time that for an environment to work, we need great applications that work under it. With so many applications available on the Windows platform, Microsoft eventually became a victim of its own success. Old luddites like me could put off upgrading their computers because what they already had was "good enough." With an 85 percent market share, Microsoft still owns the desktop. But to gain a foothold in the portable environment dominated by iOS and Android, Microsoft has to make Windows software platform-agnostic. Instead of "Windows Everywhere," Microsoft is moving its software to the cloud and providing "Microsoft Services Everywhere." And once again, against the odds, Microsoft appears to be succeeding. Abandoning Internet Explorer and adopting a Chromium-based browser is one more step along that path. Because no matter how they are delivered to whatever screen the user is using, the apps are where it's at.